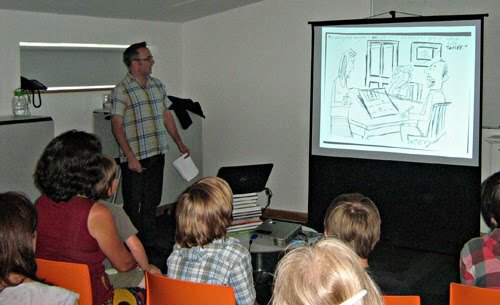 My cartooning talk and slideshow at the Summer Squall arts festival in Ramsgate went very well, I'm relieved to be able to report. 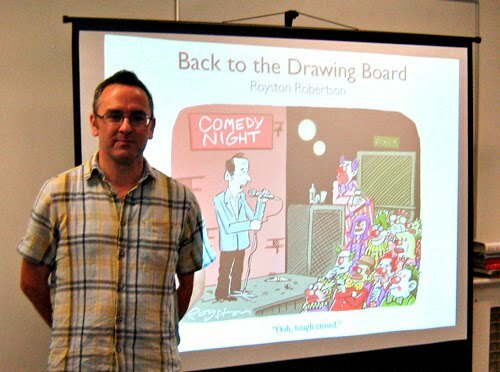 I'd been a little nervous beforehand, mostly wondering if people would laugh at the cartoons (in the desired way, that is) but laugh they did. 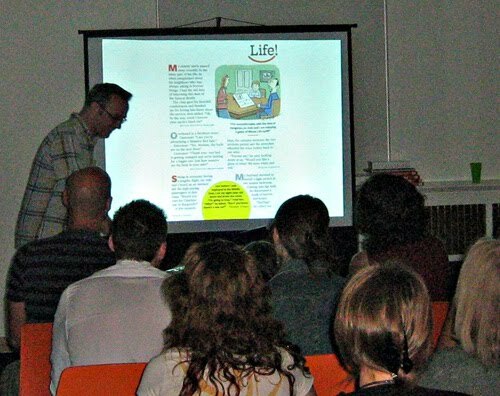 As we cartoonists work alone we don't usually get much feedback on our jokes, bar the odd email, or comments from friends, and you're never there to actually see and hear the reaction to your work. So it was a rare privilege to have an audience. The caption on the opening cartoon above is "Ooh, tough crowd." Tempting fate, I know, but thankfully they weren't. I was relieved also that plenty of people turned up for the talk, which I named Back to the Drawing Board (after the Peter Arno cartoon which introduced the phrase to the language) despite the fact that there were alarmingly few pre-bookings. The room was full to capacity and I'm told there were around 45 people there, of all ages too, from children (I'm glad I removed a couple of the more risqué cartoons) to senior citizens. ... through to the inked version, the scanned and amended version which gets sent out, the full-colour version, when required, and finally the cartoon on the magazine page, below. It was the cartoon below, from Reader's Digest in 2008, because I'd saved the original pencil sketch (which I normally throw away) for a planned "beginning-to-end" blog post that never got written. 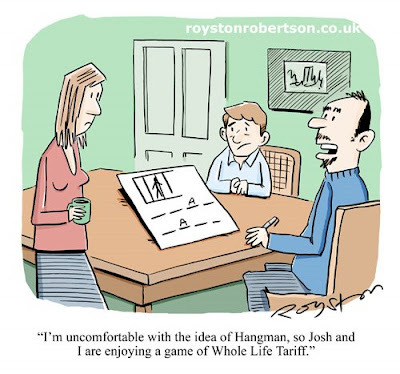 "I'm uncomfortable with the idea of Hangman, so Josh and I are enjoying a game of Whole Life Tariff." I showed how to generate ideas by riffing on favourite themes, such as art and paintings -- as it was an arts festival -- and how you can narrow it down and concentrate on a very specific theme, illustrating this with a load of cartoons, published and unpublished, on Nipper, the HMV dog. 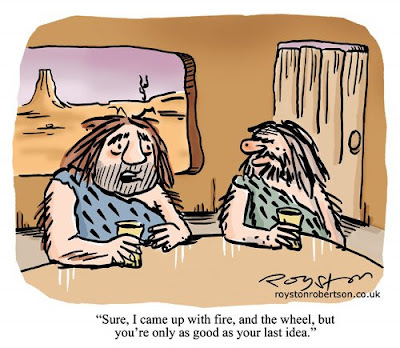 "Sure, I came up with fire, and the wheel, but you're only as good as your last idea." King of the HMV dog! Great stuff-next stop Carnegie Hall. 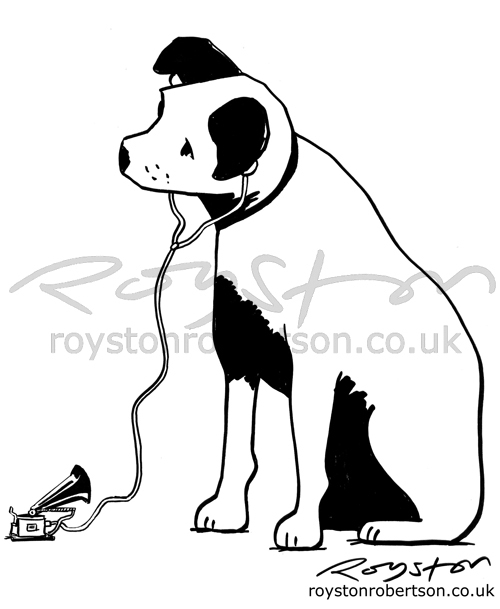 Delighted it went well for you, Royston. Nice shirt too! And Chichi, well done for spotting that I'd saved my current favourite shirt for the day! If I had a hat I'd surely take it off to you sir! Well done, looks like fun was had by all. Ah yes, the smell of the audience and the roar of the sawdust. I remember it well. Well done, Royst. You've been bitten by the showbiz bug ever since Eggheads really, haven't you? We'll be seeing more of you on TV, no doubt! Actually Simon, I've been bitten before. I dabbled in stand-up comedy in the dim and distant past. I *do* have a hat and I *shall* take if off to you! Well done Royston. Was never in any doubt it would be a success. I shall drink a celebratory root beer in your honour. Well done, Royston - looks brilliant!